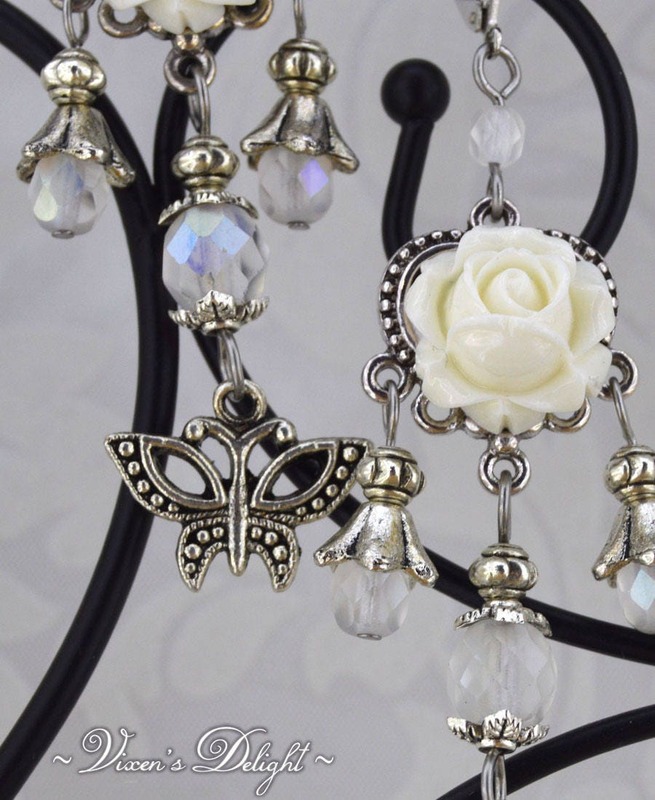 A blooming rose is the focal point of these beautiful earrings. 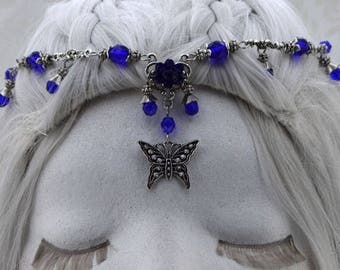 Hanging from the bottom is a precious butterfly. 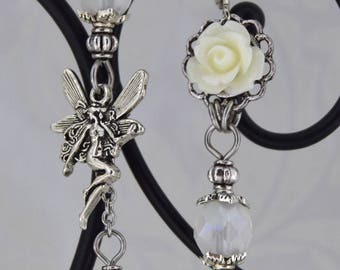 Connected to the earring with a frosted white bead that is encased in fancy flower bead caps. 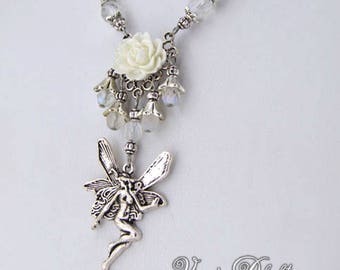 Hanging to either side is a bead droplet in frosted white with a larger flower bead cap on top, and finished with a silver tone bead. From top of ear hook to bottom of butterfly: 3 and 3/8". ~ Stainless steel wire. It is very durable, and holds together under a good amount of use. I pride myself on creating beautiful pieces that can be worn and adored time and time again. Make one of them yours today! This listing is for the earrings only. The last picture shows you the entire set. 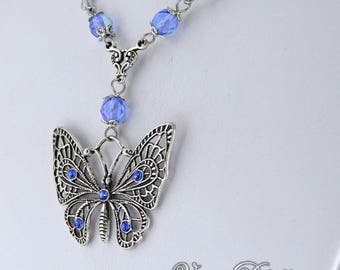 If you are interested in the necklace as well, click on the link bellow. Please be aware of any custom fees and or taxes that your country will place on anything purchased outside of your residency. Each country's fee is different. To find out how much (if any at all) you will be required to pay, you can call your local postal services and they will be able to give you more information. Beautifully made! However they are really heavy and the length causes them to swing a lot and get caught in my hair when it’s down. Love these earrings! They even jingle when I move my head. Gorgeous piece! Speedy transaction, too. Excellent transaction all around. BEAUTIFUL! The earrings are the best and they came before the expected date. My priority is for you (as my customer) to be 100% satisfied with your order. If for some reason you are not, please contact me within 14 days and I will do what I can to resolve the issue. I only offer returns on in stock merchandise, not custom made. Buyer pays for return shipping. Items must be returned to me undamaged, within 30 days of purchase. Only the cost of the item(s) will be refunded. There is no refund on shipping. The Holidays are here! To ensure your package will reach you before December 25th. Please see the shipping deadlines below (Within the US only). "Made to Order" items will ship within one to two weeks of purchase date. All other orders will ship in 1-2 Business Days. I ship Monday through Friday. My standard shipping is USPS First Class mail. If you need your order faster, I also offer Priority Mail, and Priority Mail Express. All items in my shop ship from Connecticut, so if you live in or near New England, your shipping time should be closer to the lower numbers listed. International shipping times can vary greatly. If you live outside the US, please be sure to place your order with plenty of time to spare for possible customs related delays. Are you interested in custom work by Vixen's Delight? With my collection of gorgeous beads, unusual links, and hundreds of pendants and charms, the possibilities are endless. Custom designed jewelry costs about 20% additional - to cover the extra time I'll spend making sure that your piece is perfect for you. Custom orders are made within 3-4 weeks. I do not offer returns on custom made merchandise. All custom sales are final. If you just want to give you jewelry a quick shine, a micro fiber cloth will be perfect! If you need to give it a little extra TLC, use very mild soap (I use sensitive skin dove bar soap) and a SOFT old tooth brush. - Put on perfume, makeup, and hairspray before you put on your jewelry. What metal do we use? 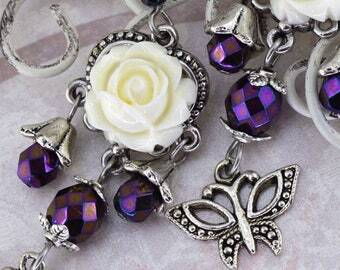 The charms, pendants, and settings we use are all made of a zinc alloy. 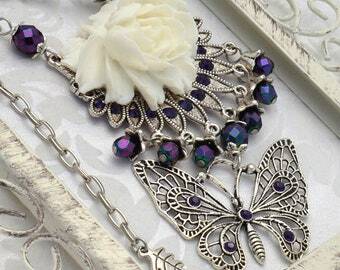 It polishes very similar to sterling silver, and keeps it color very well. All the metal is lead and nickel free. Our earring posts are mostly stainless steel with an upgrade option of sterling silver. The wire, jump rings, and headpins are all stainless steel. What are our hair sticks made out of? We have a couple stick options for you. Mostly, we use bone. This is the strongest option, and stays in the hair very well. The hair stick is made out of ox bone. 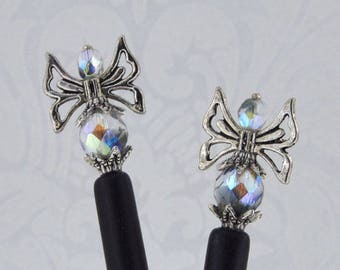 We also have metal hair sticks, and horn hairsticks. 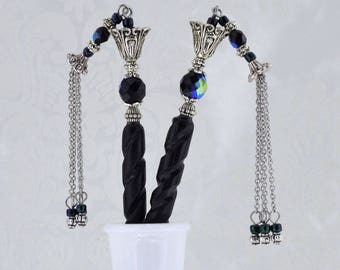 The horn hair sticks are made out of water buffalo horn.